Was very beautiful. Was not prepared for the hills to get to the Chatue Frontenac. (sorry for the spelling). It&apos;s Celebrity but not as you would know it; not for the under 70&apos;s.
Wonderful port where you can just walk around & see everything. We walked around town and had a good time. It would have been perfect if it had not been raining. Not a handicapped accessible city. The city is easily accessible from the cruise port. We walked through many old neighborhoods, had lunch at a local restaurant, toured some lovely churches, and heard several street musicians. This is a unique and lovely city. 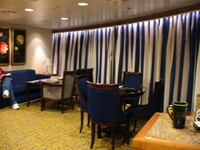 Classy cruise, great ports, super service...what more do you want?